The industry had been expecting some news from HarperCollins, a division of Rupert Murdoch’s News Corporation, as it was one of the few major publishing houses not to have announced layoffs during the current punishing retail downturn. Random House, Simon & Schuster, Houghton Mifflin Harcourt and Macmillan, which operates divisions including Farrar, Straus & Giroux and St. Martin’s Press, have all announced job losses in recent months. In the six months that ended on Dec. 31, HarperCollins’s operating income dropped nearly 75 percent, to $26 million from $103 million. Over all, the publishing industry has struggled as bookstore sales have slowed drastically. For the months of October and November, the Association of American Publishers announced double-digit declines in sales, and the holiday season was widely considered the worst in recent memory. HarperCollins has shut down the Collins division, is realigning imprints and has made cutbacks in the children’s division, too, including shutting down the Bowen Press, which had been set to launch this month. In connection with the moves, Steve Ross, president and publisher of Collins, and Lisa Gallagher, senior v-p and publisher of William Morrow have been laid off. (Ross may be reached at slross58@gmail.com; Gallagher may be reached at lisagallaghernyc@gmail.com.) Brenda Bowen, head of the eponymous children’s imprint, has also left HarperCollins. At least one sales rep has been let go. The New York Times said that at least five Collins editors are gone and that “several sales, marketing and publicity staff members” from Collins and other divisions were also laid off. As many nine people in the children’s division have been laid off, and reports are that at least one rep has been let go. Sigh. My thoughts go out to everyone hurt by these changes, especially my old friend, Brenda Bowen. We’re all in for tough times ahead. Back on November 5th, the day after the election, I acted quickly and purchased this remarkable, evocative piece of art from my friend, illustrator Greg Ruth. For the story on that, and where to find other art by Greg, click here and follow the links. This October, HarperCollins’s new Bowen Press imprint will release Our Enduring Spirit: President Barack Obama’s First Address to the Nation, a 40-page picture book with illustrations by Greg Ruth. The book will consist of the President’s speech (adapted for young readers—the entire speech will also be included, in the back matter), biographical notes about Obama, as well as an overview of his first 100 days in office. Graphic novelist/illustrator Ruth (Freaks of the Heartland; Sudden Gravity) had been sketching Obama throughout the Presidential campaign, and when Bowen Press publisher Brenda Bowen, who was on Ruth’s mailing list, saw additional Obama artwork that he had created on election night, she called Ruth and signed him up for this project, in anticipation of Obama’s inauguration. This pleases me in so many ways I can’t begin to express it. I first met Greg when he signed up to illustrate my upcoming picture book, A Pirate’s Guide to First Grade (Feiwel & Friends, 2010). We’ve exchanged emails, bonded over Magic Realism and Kelly Link, our children and books, our love for Liz Szabla and our fear of Facebook, and many other things. He’s just so incredibly talented — a true artist — and a nice guy, too. There’s a lesson in this for creative people. 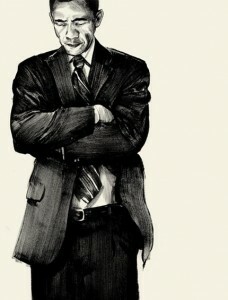 Greg was inspired by Obama, filled with hope and excitement, so being an artist he began to sketch. There was no master plan. He wasn’t thinking about books, or sales, or furthering his career. He was simply following his enthusiasms, expressing what was inside, what had to come out, his bursting joy. That it led to a book — and such an important book — came to Greg as a complete surprise. Good things happen when you follow your enthusiasms. For me, personally, the story deepens because Brenda is an old friend, from back in our days at Scholastic together. We were friends inside the office and out, even belonging to a small, happy reading group together. We’ve laughed a lot. Time passed and these days we rarely have much contact, but those old affections never die; I’ll always be crazy about Brenda. So now all those loose threads come together with this book that celebrates Obama, and the renewed hope that so many of us have for our country. 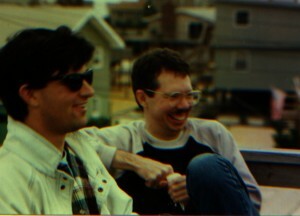 Lastly, just to add one more thread, I wanted to post a photo that was taken on October 25, 1986, at Brenda’s parents’ beach house on the Jersey shore. A whole gang of us went there for a madcap weekend. It’s a shot of me and Craig Walker, one of the greatest friends I’ve ever known. That night we drank beer and watched Game Six of the World Series together — one of the most stirring, improbable, momentous comebacks in baseball history. I was always proud and pleased that Craig kept this photo on his office wall. After he died, I visited his office. It was a terrible feeling, walking into that room. I looked around, lost, wanting something to keep. And I took this photo off the wall . . .